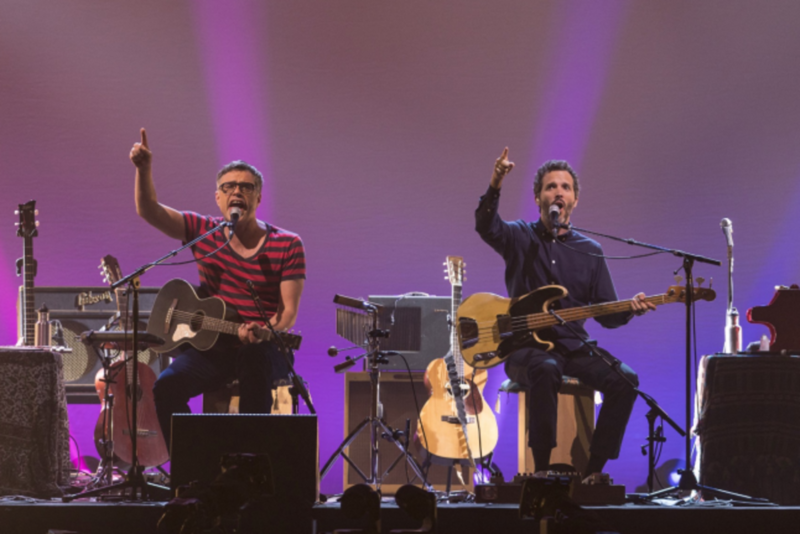 “You’ve probably noticed that we’re a bit older than we were formerly,” said Jemaine Clement, one half of the musical-comedy duo Flight of the Conchords, to open a new HBO special “Live in London.” “We’re not ill,” he assured the crowd before empathizing with how hard it can be when viewers see familiar TV characters age. Times change, hair turns gray, but the deadpan comic reversals of Flight of the Conchords are forever. And though the New Zealand duo has performed a number of times since ending their self-titled HBO comedy series after two seasons nearly 10 years ago — including a 2016 U.S. tour — forever is something akin to what it feels like since they were on TV together. Since ending the show in 2009, the duo haven’t exactly vanished. Clement has been a more common sight onscreen, lending a welcome oddball presence to indie films and FX’s “Legion” along with co-creating the 2014 vampire comedy “What We Do in Shadows” (soon to be adapted for the network as well). McKenzie is now an Oscar winner for original song, having been honored for his work on The Muppets’ big-screen return in 2011. But for all the comedy HBO’s “Flight of the Conchords” found in the gentle misadventures of two Kiwi musicians in the big city, the show’s offbeat musical interludes were its sharpest weapon. 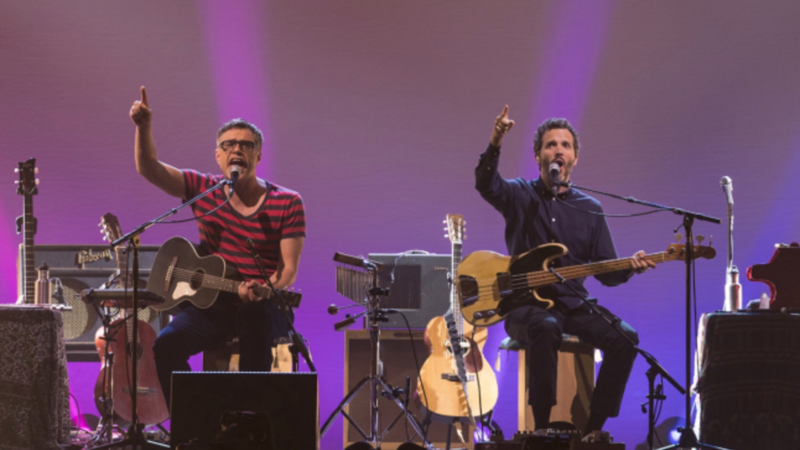 As catchy as they were funny in parodying artists and styles they admired, the Conchords’ dynamic duets were where their career took off years ago on stages including L.A.’s Largo. And it’s where they return in “Live in London,” which was recorded at a sold-out show earlier this year. As a result, the series isn’t so much a focal point here — there are no cameos from former castmates such as Kirsten Schaal or Arj Barker — as the back-and-forth dynamic and musical moments that built it. Between songs, Clement and McKenzie traded familiar jokes about their home country, at one point introducing the backing of the New Zealand Symphony Orchestra (a bassist named Nigel). Still in-character as a far bigger band, the duo dryly tweak their decadent rock ‘n’ roll lifestyle in banter about the pleasures of a free hotel muffin. Whether in these exchanges or in song, both remain lethal with subtle reactions, loading enough expression in a raised eyebrow or tilt of the head to be worthy of the silent era. This being a reunion show, the hits are to be expected. With both paying different vocal tributes to the late star, “Bowie in Space” carried more of a wistful note than years past, and, with the help of some expert drum programming and synthesizers from Clement, the moody “Inner City Pressure” remains the best Pet Shop Boys song not actually written by the Pet Shop Boys. Never content to stay in the realm of the targeted artist homages of “Weird” Al Yankovic, the Conchords also touched on airy French pop in the vocabulary test nonsense of “Foux Du Fa Fa” and medieval madrigals with “Summer of 1353,” which boldly answers whether the lunging onstage theatrics of a guitar solo can also be applied to the humble recorder. But more just revisiting the past, the Conchords also arrived with some fresh material. A folky ode to the love between father-and-son opens the show on a heartfelt note that takes several unexpected twists, and before performing a Franz Ferdinand-esque rock number about a lusty office romance between Deana and Ian, the Conchords self-effacingly described their roles in the song before apologizing for a lack of inclusion. “We are aware that comedy is a very male-dominated industry. We’re writing the roles for women, but the problem is, the band itself is very male-dominated,” McKenzie explained. “It’s systemic,” added Clement, twirling his finger in a circle above him. It was a playful instance where 2018 briefly caught up with the Conchords, whose special mostly offers a welcome, proudly silly respite from current affairs. But should the band ever mount another reunion tour like so many real-life rock stars who came before them, their genial, finely tuned perspective ensures they’ll still sound timeless.